The money donated at Council 8’s Dayton Convention to help Iowa’s AFSCME members defend their union paid a big dividend when public employees won a land-slide victory to stay AFSCME Strong in the state’s first re-certification election! Earlier this year, Iowa’s Republican-controlled state government passed anti-labor laws that gutted public sector collective bargaining. Looking to cripple unions even more, unions must hold an election to re-certify their union before negotiating new contracts. Iowa’s results are in. With 88 percent participation, nearly 28,500 AFSCME represented employees voted to re-certify while a mere 624 voted against the union – a pro-union margin of better than 400 to 1. Had Council 61 failed to get a majority of union and non-members, its current contract would have been immediately repealed and a two-year waiting period imposed before workers could hold another representation vote. In addition to a heartfelt “thank-you”, Homan’s message to Council 8 members is “You can’t take for granted that what you have today will be there tomorrow. What happened in Wisconsin and Iowa, can happen to Ohio. “You have to get engaged in the political process to elect people who are going to do what’s right for working men and women and what’s right for the labor movement,” Homan said. 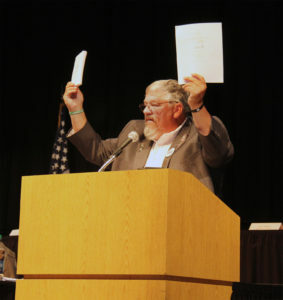 Council 61 President Danny Homan compares the state workers 100-page contract with the 12-page contract after the collective bargaining law was dismantled.